Investors avoid these two stocks for different reasons. Because of a solid dividend and potential upside, investors might be wise to stop ignoring them. Income investors looking for solid dividend stocks often stick with more stable and proven companies -- and that's a winning strategy, to be sure. However, some dividend stocks that have hit a speed bump could be diamonds in the rough and prove valuable for investors. Campbell Soup Company (NYSE:CPB) and Delta Airlines (NYSE:DAL) both have their doubters, and we'll dig into why, but both also have a solid dividend, are trading at cheap valuations, and have upside in the years ahead. Most consumers and investors have heard of Campbell Soup Company, and we generally know what the company is about: soup. However, the company's products are adapting and with its stock price down more than 40% over the past twelve months, it's time for Campbell's to transform into the future company investors can believe in. The good news is it's taking multiple steps to do just that. After a rough third quarter that sent its stock down further, former CEO Denise Morrison immediately stepped down and interim CEO Keith McLoughlin addressed concerns as best as possible. The key takeaway was that the executive shake-up will be followed by a detailed rebound plan during Campbell's next conference call in August. In addition to the strategic review and executive shake-up, Campbell's recent acquisition of Snyder's-Lance is a perfect example of how the company needs to transform. Campbell's will still have a stronghold on the soup aisle, but snacking will play a much larger role in total sales going forward -- and that's a much faster-growing segment as you can see below. Campbell's Snyder's-Lance Dec. 18, 2017, acquisition presentation. The acquisition will boost Campbell's baked snacks portfolio to represent 46% of its 2017 net sales on a pro forma basis, compared to 31% excluding the Snyder's-Lance acquisition. Management expects to generate $170 million in cost synergies by the end of 2022 and the acquisition should be accretive to adjusted earnings per share in 2019. With slipping margins, rising input costs, and a rough third quarter, it's easy to see why Campbell's trades at a price-to-earnings ratio under 9. That cheap valuation offers investors a chance to scoop up its juicy 4.2% dividend yield, which could prove smart if the company revives its top-line growth and reverses margin declines. With a dividend payout ratio sitting at 40%, there's potential for its dividend payout to move higher if management is confident in its business turnaround. It's transformation time at Campbell's, as it needs to become much more than a soup brand. Between its new leadership, acquisitions, and an upcoming rebound plan, the company is taking the actions investors need -- now it's just about execution. 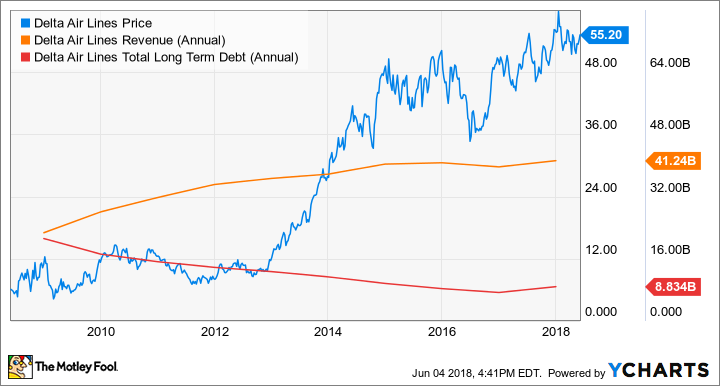 Delta is almost a rags-to-riches story, considering the progress it has made over the past decade: It has grown revenue consistently and lowered its long-term debt. Indeed, the company's first quarter had some rich highlights, including revenue growing at an impressive 8% clip to reach a quarterly record. That was much better growth than the anticipated 4% to 6% and management expects a similar pace of top-line growth during the second quarter. Adding to the company's momentum is its new joint venture with Korean Air, which launched May 1, 2018, and will expand to enable an additional 66 markets to become codeshares in North America this month. Another factor that bodes well for Delta investors is its increasing quality. According to the annual Airline Quality Rating -- which compiles data that measures on-time flights, percentage of involuntarily "bumped" passengers, mishandled bags, and complaints -- Delta narrowly missed taking the top spot from Alaska Air. It's easy to make a case that Delta is the favorite to take the title in 2019, and considering the factors measured, it would be good for its business and reputation. For all that Delta has done well with its business, the truth is investors are afraid to invest in a company with roots in such a cyclical, capital intensive industry -- and an industry that can be jolted by sudden fuel cost increases. Add to those factors that Delta has already filed for bankruptcy in the mid-2000's and you have a recipe for a company that investors tend to ignore, but that leaves savvy investors an opportunity. Delta has consistently improved its balance sheet and top-line revenue while raising important quality factors and expanding its business. It trades at a cheap price-to-earnings ratio of 11. Delta's dividend yield is a respectable 2.3% and it has surged from $0.06 per share quarterly to $0.305 per share between 2014 and 2018 -- with a payout ratio of less than 25%, the dividend has room to grow. Investors aren't yet convinced that Campbell's can execute a strategy to increase its top line through new products while reversing its recent margin stumble. Separately, while investors watch Delta increase its top line, expand its business, and improve quality, the fact it operates in a cyclical and capital-intensive industry has kept many on the sidelines. That said, both of these companies are ultra cheap, offer a solid dividend, and have more upside left in them.